After an Australian teenager posted a photo that went viral on Subway’s Facebook claiming that his “Footlong” sub was less than 12 inches, opportunistic plaintiffs’ lawyers in the U.S. ran to the courthouse. Subway currently faces nine class action lawsuits that assert the food chain’s “footlong” subs sometimes come out measuring between 11 and 11 ½ inches. Not surprisingly, most of these lawsuits were filed in states known as having the most pro-plaintiff consumer protection laws, such as California, New Jersey, and Illinois, before being transferred to a federal court in Wisconsin. Upon hearing the news about the blizzard of lawsuits, we decided to conduct our own investigation in the field and purchased a footlong Subway sub in Washington, DC. 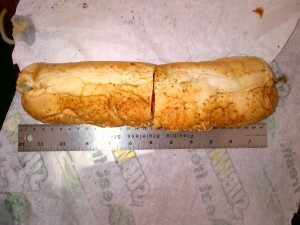 According to our ruler, the sub was about 12 ½ inches long (see picture below). We wonder if the extra half inch equates to a few more calories than the standard 12 inch sub roll, thus perhaps constituting another potential claim for misleading and deceptive marketing practices.